Southern Libyans have taken it upon themselves to stand up to Chadian militias terrorising the south ()Photo: social media. With the recent south Tripoli militia fighting, the House of Representatives’ extended saga regarding passing the referendum law and a constitutional amendment in Tobruk, the tug-of-war over who sets the date of Libya’s next elections, and the back and forth between Italy and France as to who has more influence over Libya’s future and Italy’s plans for an international conference on Libya in Palermo, Sicily, southern Libya’s quiet conflict has continued attracting little real attention from coastal Libya. The security vacuum in the south and neglect by the two main coastal factions in Tripoli and eastern Libya have left the south of Libya open and vulnerable at the kidnapping mercy of opposition militias from neighbouring Sub-Saharan African states. A series of kidnappings took place in the last two moths allegedly carried out by foreign elements active in the area between as far north as southern Sirte and the Jufra region and to the southwest between Tmassa village (161 Kilometres southeast Sebha) and to the Wadi al-Buwnis area of the Samnu, Zeighen and Taminhent road north to Jufra region – and south to Ghadduwah and Tmassa villages. On 9 August teenager Ahmed Milad Yousif al-Majiri was kidnapped on the Jufra-Buwanis road. On 14 September Khalid Mohamed Aswad Reyahi and Saleh Ibraheem al-Miyassi were kidnapped on the Samnu-Jufra road. By October this year, the estimated number of civilian abductees by foreign armed militias increased to over 34. Over half have been released for a minimum ransom of LD 120,000. Fed up with their plight and having given up on any real long-term help arriving from the distracted coastal powers, on 16 September locals from Sokna, Fugha, Brak and Wadi al-Buwanis with the Khalid Bin Walid brigade gathered and launched an attack on the Chadian militias, freeing two detainees and killing at least 6 members of the Chadian militia. 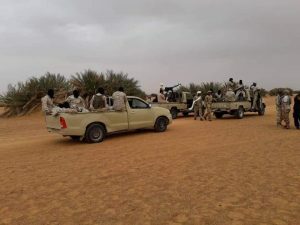 On 28 September, the Sebha Triangle Joint-Security Room, Khalid Bin Walid brigade and the Qatroun Directorate, together with locals from nearby towns, attacked the Chadian militants near Gaberoun Lake (150 Kilometres west Sebha), killing at least 3 three militants. The actions, however, led to a reaction from the kidnappers, resulting in increased of kidnappings. On 7 October, six civilians from Fugha, for example, accompanied by their families, were kidnapped. The women were left behind. Yesterday evening, fierce fighting erupted between the Khalid Bin Walid brigade and Waw Brigade, on one side, and a Chadian militia believed to be supported by a man named Abdul-hakeem al-Kreedi, a key Chadian opposition militia figure, and linked to the Chadian Le Front pour l’alternance et la Concorde au Tchad (FACT) at Maghnai valley and Ghanema hills, a few kilometres east of Tmassa. As result, four soldiers died (Warduko Ardia al-Tabawi, Ali Mohammed Rami, Mabrouk Abdulsalam Jilawi and Corporal Nouriddin Saleh Jilawi) and up to 12 wounded. Another 6 were taken hostage. On the Chadian militia side, 11 members were reportedly killed, and dozens were subsequently captured. Intense fighting continued this morning, despite the control of the surrounding areas from Tmassa, Torbou and Um Aranib and a further 260 Kilometres southeast near the Fuwar (volcanic water spring) site as the Um Aranib martyrs’ brigade commanded by Barka Sharfadin is reported joined the fight against the Chadian militia. According to a source in the Sebha Triangle Joint-Security Room the Chadian militia has used a number of Sierra Leone armoured vehicles that in his view contributed to the high number of casualties. It is to be noted that the Salafist-leaning Khalid Bin Walid brigade, also referred to as brigade number 104, commanded by Yousif Hussain Saleh, is made up of a Tebu core of fighters, but it also consists of fighters from other communities in nearby towns. It has emerged as a robust fighter against the Chadian militias in battles in al-Shargiya (Um Aranib and its surrounding area). It unofficially announced itself on the southern scene in early August, setting up checkpoints on the Sebha-Al-Shargiya road and the Murzuq-Um Arnib road where it has been enforcing security, checking armed elements and combating drugs and alcohol. On 10 October, four Tebu tribesmen were reported kidnapped on the Murzuq-Qatroun road and a ransom was demanded to secure their release. This Saturday at dawn, a series of airstrikes were reported to have targeted Chadian opposition militias in southern Tmassa and north of Um Aranib on the road to Chadian border. A Chadian militiaman (Mohammed Khair) was reportedly killed in the airstrike. The militia was thought to be heading to northern Chad when at least five airstrikes targeted their convoy. The Khalifa Hafter-led and eastern Libya-based Libyan National Army (LNA) launched several airstrikes against the Chadian opposition militia Counceil de Comandament Militair Pour le Salut de la Republique (CCMSR) during March and May of 2018, but observers say these have had no real effect on the Chadian militias. Although in June this year, the LNA carried out an airstrike against CCMSR near the Chinese company complex in Um Aranib which was reported to have resulted in significant loss in lives. In Kufra, in the extreme south east of Libya, 13 civilians have been kidnapped, also widely presumed to have been carried out by Chadian elements. On 6 September 90 Kilometres north of the Kufra-Jalu road at the 2011-abandoned Turkish TEKFIN company site, were exchanged on 30 September by a group held earlier by the Kufra’s LNA Salafist Subol al-Salam brigade. Subol al-Salam brigade is accused in a UN Libya Panel of Experts letter, dated 5 September, of being involved in human trafficking. “The Subul al-Salam Brigade, affiliated with the LNA, is involved in the smuggling of migrants despite being mandated by the LNA to combat trafficking at the border (see annex 19). The brigade provides escorts to convoys from the border from the Sudan to Kufrah at a rate of 10,000 dinars per pickup. In Kufrah, it holds migrants at the al-Himayya camp, where extortion and forced labour have been reported.”, the panel reported. On 5 October, another 12 bird hunters from Ajdabiya were kidnapped by an armed group after they apparently strayed into the Sudanese side of the border. South Libya has also become an increasingly dangerous place for both locals and foreign nationals working in the oil industry. On 6 July, four foreign engineers, three Pilipino and one south Korean, working at the Man-Made River (MMR) station in al-Hassawna mountain, 900 Kilometres south Tripoli, were kidnapped. This occurred just two weeks after the release – after an 8-month kidnap period – of the Turkish engineers working at the Ubari power station. The majority of foreign armed militias present in Libya today were brought in in mid-2014 as a result of the political/military fallout between Hafter’s Libya Dignity and Tripoli’s Libya Dawn. Various armed groups which had started off as opposition armed movement to the regimes in their home countries, along with dozens of mercenaries and opportunist gangs, took advantage of Libya’s security vacuum. Khalifa Hafter’s LNA made use of militia groups mainly from the Darfur province such as the Justice and Equality Movement (JEM) and Sudanese Liberation Army (SLA) while Chadian oppositions militias were preferred by Misrata and other factions in west Libya. By late 2016 these various foreign militias were abandoned by their paymasters and they headed southwards to the Libya’s vast ungoverned southern expanses, where they started to pick-off vulnerable civilians and threaten the livelihood of the citizens in the south, carrying out illicit cross-border trade, human trafficking, smuggling Tramadol and alcohol part of an effective self-funding criminal business cycle.